Four parliamentary seats to represent Māori were introduced in 1867, with the intention that they would be abolished after five years. In 2002, the seats increased in number to seven. New Zealand’s first Parliament was established by statute in 1852. Only males who held property worth more than a certain amount could vote. This limited Māori participation, as most Māori property was communally owned. In 1867 four seats were introduced to represent Māori. All Māori males aged 21 and over were given the vote – 12 years before all Pākehā men. The few Māori men who owned freehold property could also vote in European electorates, until 1893. From 1893 all New Zealand men and women could vote. In 1867 each European seat represented about 3,500 people, but each Māori seat represented 12,500. The Māori seats were fixed at four for 129 years. From 1896 to 1967 Māori (except 'half-castes') were not allowed to stand as candidates in general electorates. From 1975 Māori could choose whether to be on the Māori or general electoral roll. In 1993 MMP (mixed-member proportional representation) was introduced. The number of Māori seats became based on the number of people on the Māori roll. By 2002 there were seven Māori seats. More Māori were also elected to general seats. Some people think the Māori seats should be abolished. They believe the seats are racist or Māori are well-enough represented in Parliament. Others support the seats for helping Māori to participate in Parliament. The Young Māori Party was the name for a group of Māori MPs from different parties, from the 1890s. The Rātana religious and political movement became aligned with the Labour Party in the 1930s. From 1943 to 1993 Labour held all the Māori seats. Mana Motuhake was an independent Māori party formed in 1980. In 1991 it became part of the Alliance, and won seats in Parliament under MMP. New Zealand First won all the Māori seats in 1996 – but Labour won them back in 1999. 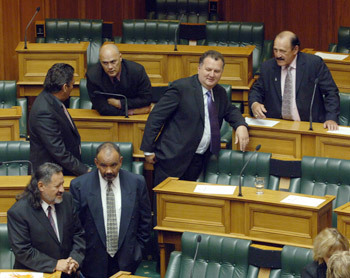 The Māori Party won four Māori seats in 2005 and five in 2008, and supported the National-led government from 2008 until 2017. The Mana Party was set up in 2011 by Hone Harawira. In 2007 less than 5% of successful candidates on local councils were Māori. Māori seats on councils have been suggested, but few councils have set them up.